Who is Roots and Wings Midwifery? Hello! We are Rebekah Mustaleski, Libby Colsen, and Rachel Chandler and we are the Roots and Wings birth services team. We look forward to hearing from you and being able to serve you and your family through this season in your life, but in the meantime, we hope you'll take this chance to watch this video and find out a little more about us. Roots & Wings Midwifery - Evidence Based Care from Rebekah Mustaleski on Vimeo. Roots & Wings Midwifery - The Birth Team from Rebekah Mustaleski on Vimeo. I've loved pregnancy and childbirth for as long as I can remember. 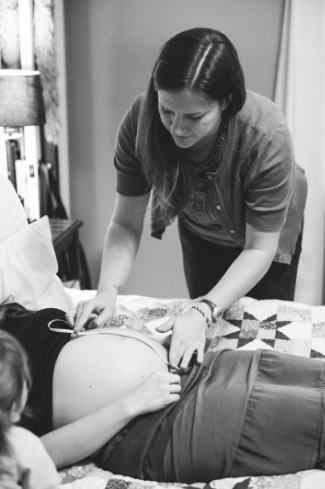 I've been honored to serve women and families as a doula and childbirth educator in Knoxville over several years where I attend labor and birth in a variety of settings. This experience has been exciting and enriching in so many ways and has inspired me to pursue my passion for Traditional Midwifery. I am so thrilled to be a Certified Professional Midwife and my hope is to provide exceptional care to families in Knoxville and the surrounding areas. I've been so blessed to have such a supportive and loving family at my side, including my husband Aaron and our four wonderful little ones. I think it is important for them to be surrounded by those who love them and will support them as they find their way through the labor process. I also believe that how a woman in labor is treated has a large impact on whether she is encouraged by the experience or not. Throughout my training, I have worked with many women in a variety of settings. I have a strong desire to educate women about their options regarding labor and delivery so that each family can make their own decisions about what is right for them. As a licensed CPM, I am thankful that I can continue to encourage women to be in charge of their birth experience. Though I have lived in several other places, Knoxville has always been home to me. I live with my husband and four kids in the house my grandparents built. I homeschool my children and find there are never enough hours in the day for all of the things I want to do. My journey to midwifery began when I read Ina May’s Guide to Childbirth and felt a profound calling to support people in labor. In 2013 I attended a brief Midwife’s Assistant training at The Farm Midwifery Center followed by a doula training in Boston. For several years I practiced as a doula, supporting families during their hospital births. I also apprenticed with a midwife in Boston where I became wholeheartedly enchanted with home birth. In 2016, I moved to El Paso, Texas where I attended Maternidad La Luz, an accredited academic program paired with a clinical placement in a high volume birth center. During my time in the program I attended many beautiful births, each one of them a gift. I marveled at the experience of welcoming new life into my hands. I remain extremely grateful to the powerful women who allowed me to learn with them through their pregnancies and births. After I graduated and became licensed as a CPM, I joined Roots & Wings Midwifery. I feel truly blessed to be working with these incredible midwives and families. ​I live in South Knoxville with my husband where we're remodeling an old farmhouse. We plan to put some goats and sheep in the barn just as soon as renovations are complete! We spend our free time mountain biking, swimming in quarries and getting to know this beautiful city.